The recent launch of Gaia gave a boost of popularity to astronomy missions. Blasting from the Guiana Space Center in French Guiana, the Soyuz-STK rocket carrying the European Space Agency flagship mission delivered its cargo to orbit on December 19th last year. After a month-long travel to its final orbit, the Gaia mission is finally ready to start mapping a billion stars close to our Sun. Doing astronomy in space is no small deal, even for a state of the art satellite, as we will see. Do not get lost… (Credits : NASA). Space astronomy missions are one of the most well known uses for space. 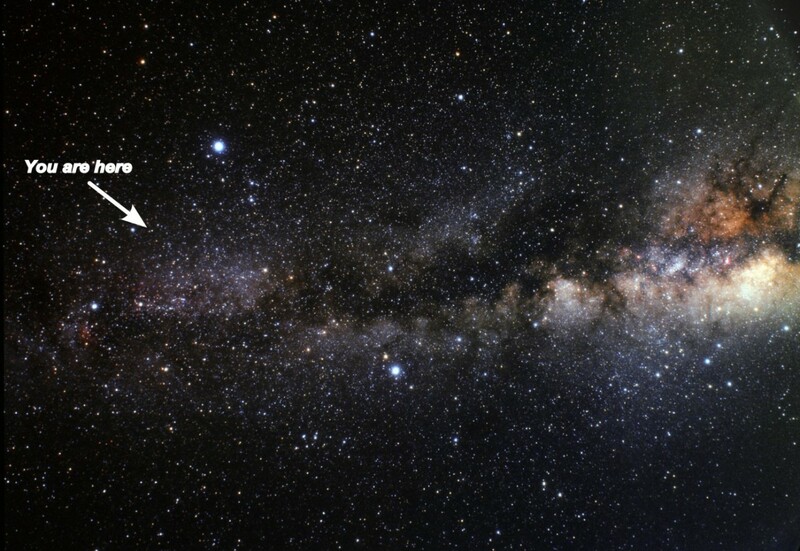 While astronomers back on Earth are struggling to get past the interferences created by the atmosphere, or having to wait for an inconvenient cloud to get past, telescopes in space have a 24-hour day of clear sky. But this dream-come-true situation for astronomers is a challenge for engineers building the space platforms and telescopes. As for any other space mission, safety is an issue that is discussed, studied, and tested before any systems are launched and operated. Any satellite is divided in two parts: the payload and the platform. Platforms are doing the boring but vital tasks, like providing electricity, propulsion, or guidance to the satellite. Payloads, on the other end, make it to the first page of the corporate brochures, and for a good reason: they are doing the mission. Payload tasks go from providing worldwide transmissions, to giving you the means to tell on which road you’re driving, or, for Hubble or other astronomy missions, providing gorgeous images of the cosmos that tend to become desktop wallpapers. The Gaia Sky Mapper mirror assembly (Credits : CNES). 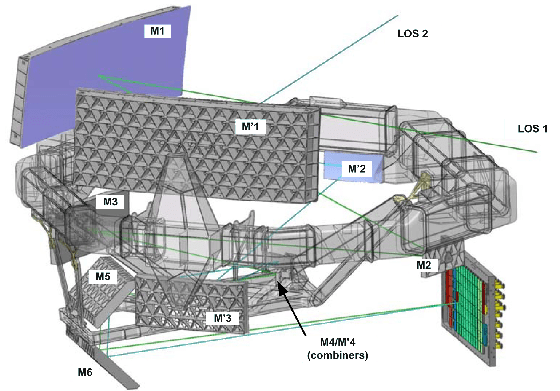 Payloads in space astronomy are usually an instrument of some sort, like a giant telescope, or a very sharp radio antenna, or in the case of Gaia a combination of a Sky Mapper, a photometer, and a Radial Velocity Spectometer. Simply put, it is a precise measuring ruler to evaluate distances between stars. It is also why the Gaia mission is actually doing astrometry, the science of evaluating distances between celestial objects. While space safety usually brings images of exploding rockets to the mind, this magazine proves on a regular basis how much larger the scope of space safety is. It can sometimes take very subtle forms, and space astronomy (or astrometry) is a good example. For any astronomy mission, one of the most important issues is to remain still. Very, very still. We all tried the very simple experiment of taking, on the go, a picture from a moving car of a charming cottage on the side of the street, only to discover a few hundred meters later that the picture was all blurred. You then have to go through the process of kindly asking to “please drive back,” and try again, only this time at a full stop. The same is true for space telescopes, only the distance to the object we try to observe is far greater, which means that the stability of the telescope is a main design and operational issue. Lose the capability of keeping your satellite very stable, and every shot you take (or every part of space you listen to), will be white noise. There are two kinds of stability needed: structural stability and control stability. Structural stability is the hardest to achieve as it requires a very good knowledge of how your structure will react in space. Materials in space tend to have different properties than on Earth: plastics for instance can become very fragile, metal layers can join without fusion (cold welding), etc. The thermal environment of a satellite adds to the complexity of the situation, with parts facing the sun for too long heating up to nearly 260°C, while parts in the shadows can go below -100°C (colder than solid CO2, or “dry ice” on Earth). Any material will change volume if submitted to these extreme temperatures and will bend if the gradient of temperature is sharp. Should you not believe it, try a simple experiment next time you roast a meal: try pouring a large amount of cold water in the ceramic plate just out of the oven… And have an extra meal ready to cook in your fridge, because in all probability, the plate will break apart instantly. On a spacecraft, keeping structures steady is assured in large part by a rigorous design that tries to average thermal conditions around the spacecraft. Some parts are designed to conduct heat while others act as a shield. Heat pipes are also used to conduct heat to radiators, sending the heat back into space. On some spacecraft, like Gaia, deployable solar shields are even mounted to guarantee that the instrument remains cold. 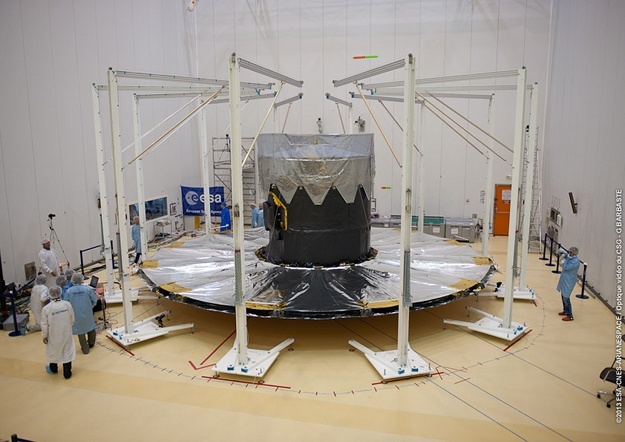 Gaia solar shield undergoing a deployment test at the S5 facility in Kourou (Credits: ESA/CNES/Arianespace). Once your satellite is well designed and its structure steady, you still have to ensure the pointing of your satellite and its stability. This task goes to the platform and more specifically to the GNC subsystem. GNC is short for the three basic tasks of this subsystem: Guidance (Where do I go? ), Navigation (Where am I? ), and Control (What do I do?). The GNC subsystem requires sensors and actuators. All of this equipment (and especially actuators) are prone to failure since they have mechanical parts in movement. Redundancy of all GNC equipment is therefore a must. Triple redundancy is usual, quadruple redundancy quite common, especially if you want your mission to be a long one. Reaction wheels are a usual choice as rotation actuators. They basically use the same science as ice skaters spinning: when the ice skater moves his arms away from his body, the spin reduces and when he pulls them in, the spin accelerates. Several other solutions can be used such as spinning the entire satellite, thus giving it stability around one axis, or using Earth’s magnetic field, if close to the Earth, just to mention a few. The Hubble space telescope, one of the most famous astronomy missions, is a good example of how critical this equipment can be. Hubble has been serviced five times by the space shuttle during which at least ten parts related to the GNC subsystem were replaced. 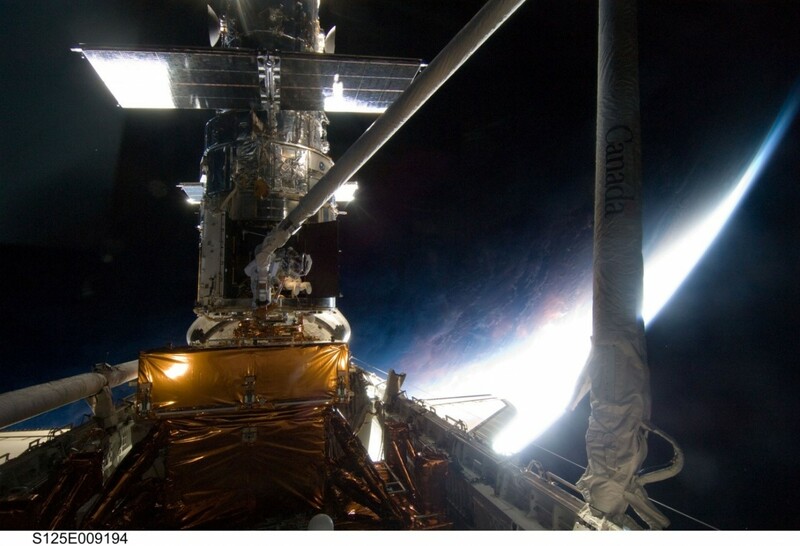 Hubble serviced by the space shuttle Atlantis (STS-125) (Credits: NASA). With the retirement of the Space Shuttle and advances in electronics, optics, and other astronomy related technologies, an increased number of next generation missions are bound to leave low Earth orbit (LEO) mostly to be located around the second Sun-Earth Lagrangian point (L2 for short), which is permanently located on the far side of the Earth as seen from Sun. But as much as being away from Mother Earth has its advantages, it also means that you are all alone now and that your parents will not support you anymore. No more reaction wheels for Christmas. You could argue that with the end of the Space Shuttle era, servicing satellites is a thing of the past anyway, which is partly true. However, even if servicing is so 2010, Earth also protects satellites in LEO from cosmic radiation, solar winds, and other nasty particles. 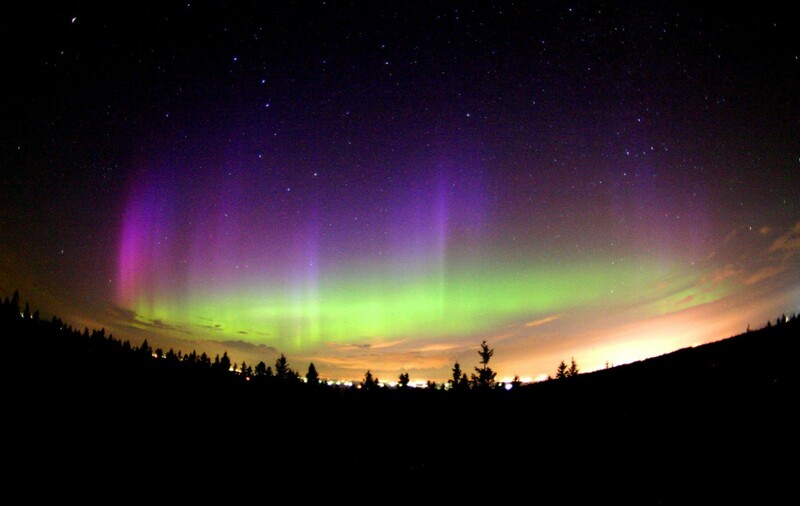 These events are nice to look at when they take the form of northern lights but can do critical damage to electronic systems when experienced in space and away from Earth. Nice looking, but dangerous… (Credits : NASA). Should a space agency lose its 100-million-dollar digital camera in space because of a solar flare two weeks into operations, tax payers and their representatives will no longer be that enthusiastic when paying the bill. Hardened electronics are therefore required. These electronic systems can detect and automatically solve single event upsets (SEU). SEUs happen when a charged particle has changed the property of your onboard electronics by changing a 0 to a 1 or the other way around. But with all its solar storms, L2 is undoubtedly a nice place to do astronomy: while orbiting L2, the satellite remains at the same distance to the Sun, and to the Earth. With the Earth only 1.5 million km away, communications going at light speed are not too long, nor do they require a big transmitter. Another nice fact is that the satellite does not have a big blue ball that prevents it from watching half the sky. Any telescope in LEO has a hard time observing targets for a long time, as their orbit inevitably puts Earth in the field of observation at some point. Satellites in LEO also have to deal with the upper atmosphere and the Earth’s magnetic field, which can be as devastating as solar storms in the long run. Let us get out and see the world ! L2 is getting crowded. And that is a good thing because getting our telescopes farther create some challenges, some of which we have approached in this article, and clearly we are overcoming them. It is easy to be nostalgic of an era of astronomy closer to home where giant telescopes where deployed from giant space vessels. While that is now a thing of the past, the next step still holds a lot of promise, and even if it is not as photogenic, it should excite us. The mere fact that we can work in L2 with automated science missions of unparalleled complexity proves that space engineering is advancing in the right direction. In these missions, safety, and a very good knowledge of your system, is the key. Getting away from Earth’s immediate suburbs with cutting edge automated missions shows that agencies and space industries are getting more confident in their designs and concepts of operations. We have seen over the last few years a sharp shift in priorities in western space programs. With the International Space Station (ISS) now at full capacity, and private corporations such as Arianespace, SpaceX, and Orbital Sciences in charge of launching cargo to the ISS on a regular basis, the target of next generation space missions is basically to be decided by our governments’ funding policies. Asteroids are a recurring theme that holds promise from a scientific point of view and offer a target still unvisited by humans. If the decision is made to send our next generation of astronauts to these free flying rocks, we will have to build up from the experience of our automated missions in L2, including astronomy missions. Getting away from LEO is the ultimate proof that the ever cautious and pessimistic engineers are getting confident in their technologies. It is a sign of optimism for the future of space exploration, and in these times of uncertainty, it is very good news.